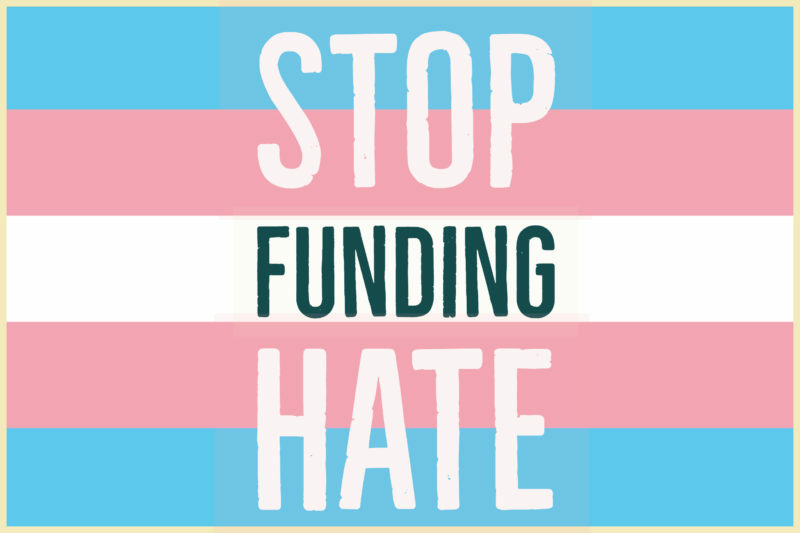 Stop Funding Hate is proud to have supporters from across UK society, including many people from the trans community. Trans women, trans men, and non-binary people have been at the heart of this campaign from the outset – and have been directly involved in some of our biggest campaigning successes. One of the core principles of Stop Funding Hate is that it’s vital to oppose all forms of hatred, and to stand with everyone who is being targeted by the media simply because of who they are. Over the past year there has been a welcome reduction in the number of anti-migrant and anti-Muslim front pages in several UK newspapers. However, during the same period, there has been an upsurge in inflammatory media stories across the UK press, portraying trans people in a very negative light. Across the world, trans and non-binary people still face appalling levels of hatred, discrimination and violence. In the UK, the last two years have seen a spike in hate crime towards trans people. Rates of attempted suicide among young trans people are shockingly high. Groups working with trans and non-binary people are deeply concerned that the current surge in anti-trans media coverage is making these problems worse – and is adding to the pressures felt by many who already face hostility and discrimination on a daily basis. There is widespread concern that the rhetoric now being used to stigmatise trans people mirrors the tropes used in previous eras to spread fear and hostility towards the wider LGBT community. Stop Funding Hate is proud to be an ally of the trans community in categorically opposing transphobia. Trans people have the right to be accepted in the gender they know themselves to be. Trans acceptance is part of building a society in which people of all backgrounds are respected and valued. The only effective way to defeat hate is to reject all forms of discrimination and refuse to be divided against each other.